Features a stainless steel clamping collar that can be tied directly to the NobleSeal TS waterproofing system. 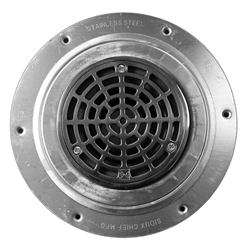 Bottom of Drain to Flange: 4.25"
Minimum hole size for drain: 5.75"
Your shopping cart is currently empty. Please go to the tabs above or the Quick Links on the left hand side to select your products. Your project list is currently empty. Go to the product(s) you would like to add to your Project List, enter the quantity you need, and click the "Add to Project List" button.